There are a number of ways to contact us. If you have questions or comments please let us know. You may contact our office using the information below or use our online contact form. 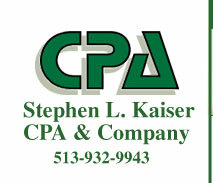 Stephen L. Kaiser CPA & Co. Simply fill out the information and click the "Submit" button. We will have someone respond to your inquiry as soon as possible. © 2005. All Rights Reserved. Stephen L. Kaiser CPA & Co. Site design by GO Concepts, Inc. Hosted at deXaweb.